Do you love Pepsi and/or Mountain Dew? Do you miss the days when they were made with real sugar instead of corn syrup? 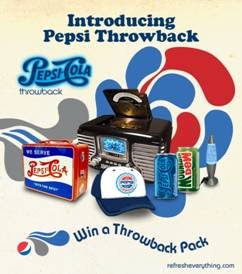 Pepsi is running a Pepsi Throwback event for the next 8 weeks or so when some of their Pepsi-Cola products will be made with natural sugar again in retro-looking packaging! You have to check out their groovy website for fun, retro videos and pictures! The gift pack is worth $150, and can be shipped to any U.S. address. This is a QUICK giveaway, so don't delay in leaving a comment!! If you want to win this package, leave a comment below by midnight, April 30, 2009! Winners will be selected on May 1, and I'll send the winning address to the PR firm right away for shipping. What a great blog!! AND YES it would be nice to have no corn syrup. My son is allergic and we can find one brand at Fresh and Easy that has no corn syrup. REtro is so cool. I have a couple of old glass coke and pepsi bottles. Even some other brands. I miss glass bottles! I wish they were back bigtime and for the same price as plastic. Throwback should become permanent!! I've actually gotten to try the Pepsi Throwback, and it's really good. And I say that as a DEVOTED Coke drinker! I normally don't like Pepsi because it tastes really super-sweet, but the Throwback version tastes much drier and doesn't coat your mouth in the same way. Throwback is a lot more refreshing. Pepsi's found themselves a new customer (for the next 8 weeks). I haven't had the Throwback Mountain Dew yet, but a friend of mine is incredibly pumped about getting his mitts on some! I'm in. Can I win again? Thanks! oooh, awesome! What a brilliant idea from Pepsi! Coke makes some products without corn syrup around Passover, but I've never seen anything like this! My littlest was allergic to corn for a while, and that was the worst. I wanted a soda that had caffeine but no corn syrup! feh! I'm in! My DH is allergic to corn syrup so I'll have to make sure to try and find some of this Pepsi throwback. I would love to have a taste of my youth. Soda is just not the same with HFCS. Awesome! I greatly prefer sugar over the stupid corn syrup. I love Pepsi! Thanks Melanie. Ooh, I hope I win! Thanks for sharing. I am an avid Pepsi drinker...Coke blech! What an awesome giveaway!! I love Pepsi and love they are going back to using real sugar!! YAY! Sweet! It is always fun to see the retro designs and using real sugar is nice!